If you need imaging services, it's good to know you don't have far to travel. Marshall Medical offers some of the most advanced imaging systems available. Peace of mind is what most imaging patients are looking for. At Marshall Medical Centers, we strive to ensure your needs are met with the latest in digital imaging technology, by staff that understands and cares about your health concerns. Time is of the essence with many tests. Patients often can be scheduled the same day the need for imaging services is determined. Three convenient locations in Marshall County eliminate the need for you to travel long distances. After your exam or scan, the images are sent electronically to the radiologist via our PACS system, allowing their findings to be sent to your physician quickly, often within hours. An experienced, board certified radiologist will interpret your exam by analyzing the images. The radiologist will then send a signed report to your referring physician who will discuss the results with you. Most reports are available to your physician within 24 hours and often within the same day of your exam. Most often used to diagnose or stage cancer, this scanner eliminates the need for separate PET and CT scans. Both tests are done at the same time, reducing test time and inconvenience. The dual imaging capability of multi-slice PET and CT allows for improved imaging accuracy which gives the radiologist more overall information of your anatomy. This high volume of dual imaging provides more confidence in the overall findings of each case, thus giving you peace of mind that the radiologist is clearly seeing small tumors that may be present. Positron Emission Tomography (PET) is a non-invasive test that examines the cellular function of the entire body. It is used to locate diseased areas of the body and is most commonly used to locate or stage cancer. PET may also be used to diagnose or treat brain disorders such as Alzheimer's, Parkinson's disease or epilepsy and to detect heart disease. PET scans begin with an injection of a radiopharmaceutical drug (FDG) which travels through the body and collects in the organs or tissues which are being examined. The patient lies on a table that moves through the scanner stopping at intervals for the scanner to detect gamma rays emitted from the patient. This produces digital 3-D images that detect diseased areas. PET can detect the disease earlier than MRI or CT alone. Detection of disease is an important use of PET; however, it is also useful in staging the disease. PET can determine if a tumor is benign or malignant, if it has grown or shrunk, and if the cancer has spread to other parts of the body. When examining cancer patients, PET is always used in conjunction with CT to provide the most accurate information for diagnosis and treatment. With the benefit of the combined PET/CT scanner at Marshall Imaging Center, the patient does not have to be scheduled for two separate exams. The PET and CT portions are done at the same time, allowing the patient to complete their exam quickly and be on their way. This also provides the radiologist with all of the needed information to provide a complete and accurate report for your physician. CT is the fastest growing and constantly changing imaging modality in the world of medicine. Our multi-slice CT scanners have dramatically changed the length of the scan time as well as the volume and quality of the images that are produced. Many of our scans produce image slices which are only 1 millimeter apart. Due to the breakthrough of multi-slice CT, there are many applications that are being routinely used which were unheard of in our area just five years ago. While there are many new and exciting imaging applications that our scanners are capable of performing, virtual colonoscopy currently leads the pack of "wow" CT imaging procedures. This revolutionary technology is a complement to conventional colonoscopy that features an end result series of thinly sliced images that can be viewed on a computer in a way that allows the radiologist to "fly through" the colon forward or backward and view the colon in a 3-D perspective in a 360° radius. CT combines the technology of specialized computers with x-ray to produce images of the internal organs. The images provide cross sectional views of the area being studied, thus allowing the radiologist to more easily diagnose cancers, cardiovascular disease, infectious diseases, injury or trauma to an internal organ or musculoskeletal problems. CT is often referred to as a CAT scan. CT imaging is one of the best tools for studying the brain, chest, abdomen and pelvis and can be used to detect or diagnose vascular diseases that may lead to stroke or kidney failure. It is an excellent means of assessing pulmonary embolisms (blood clots) and abdominal aortic aneurysms. For patients with cancerous tumors, CT is used to plan and properly administer radiation treatments. You may be asked to not eat or drink for several hours prior to your scan. You also may be given a bottle or two of a contrast material that you should drink prior to your scan. Contrast is often used to aid in highlighting the areas of concern during your scan, allowing the radiologist the best view possible. You should inform the technologist of any allergies or previous reactions to contrast agents or "dye." Nuclear Medicine uses injections of specific radiopharmaceuticals into a vein in your body that flows and concentrates in the target organ. Our "state of the art" gamma cameras then image the target organ over a period of time. While we have the ability to perform a wide range of imaging procedures in nuclear medicine, scans of the heart, gall bladder, lungs, thyroid gland and bones are the most common. This type of imaging is mainly used to examine or measure blood flow to the target organs, as well as the determination of proper function of the target organs. Imaging time for these procedures vary greatly, but are usually completed in 2-3 hours. The amount of radiopharmaceuticals that are injected into a patient for nuclear imaging is exceedingly small and is usually excreted by the body within 24 hours. The latest technology in mammography is being called the single greatest break-through in breast cancer detection in the last 30 years. 3D mammography offers a 41% increase in the ability to detect more invasive cancers. It is now the exclusive method for breast cancer screening used at Marshall Medical. Magnetic Resonance Imaging (MRI) is a scan that uses a strong magnet, radio waves and a computer to create detailed images of your body. It is a non-invasive, safe and painless way for doctors to get a closer look at bones, organs and tissues inside your body. It is used to help diagnose diseases and many other medical conditions. MRI does not use ionizing radiation as with CT or X-ray. Depending on your symptoms, an MRI will scan a specific portion of your body to diagnose: tumors, heart damage, lung damage, problems with your eyes or ears, sports injuries, problems with your spine, including disc (rubbery cushions between your backbones) problems or spinal tumors, problems with your veins or arteries, brain abnormalities, such as tumors, and dementia, abdominal/digestive tract problems, bone diseases and conditions and pelvic problems (in women) or prostate problems (in men). Magnetic Resonance Angiography (MRA) is a type of MRI that is used to image the blood vessels and blood flow. Thanks to cutting-edge technology offered in the latest installation to Marshall Medical Centers’ arsenal of diagnostic imaging tools, patients enjoy the benefits of a large, wide bore MRI system that can accommodate patients up to 500 pounds. The larger opening means all patients feel more relaxed and comfortable. It is also much faster than previous generations of MRIs – reducing the amount of time patients have to spend in the machine. Another feature of the MRI at Marshall Medical is advanced vascular and neuro imaging, which improves visibility of the blood vessels, brain and skeletal systems. It also provides advanced imaging for breast MRIs, if mammography reveals a mass that needs further testing. 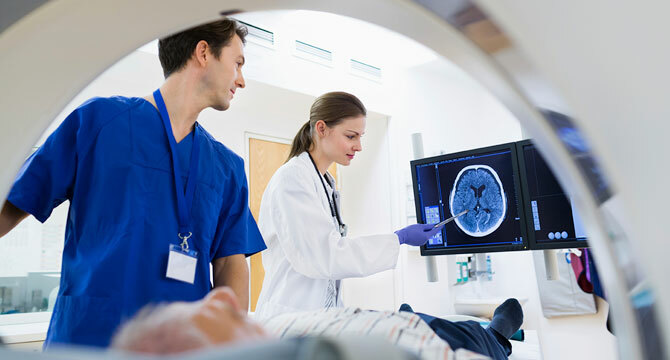 MRI is safe for most patients, however, due to the strong magnetic field, you should inform your physician or the scheduler in your physician's office, as well as the MRI technologist, if you have a pacemaker, any type of implant, clips used for brain aneurysms, or if you have had surgery recently. Most metal used for orthopedic surgery will not pose any risk; however, you should always inform the technologist of any metal that is implanted or embedded in your body. Ultrasound, also called sonography, is a way of examining many of the body's internal organs. It involves exposing part of the body to high frequency sound waves to produce pictures of the inside of the body. Ultrasound exams do not use ionizing radiation, as is used in x-rays or CTs and there are no known harmful risks. Ultrasound images are captured in real-time, so they are able to show the structure and movement of the body's internal organs. Ultrasound may also be used for special procedures such as needle biopsies. These biopsies are used to extract sample cells for testing. Breast needle biopsies, one of the more common needle biopsies, are often done to test for cancer cells. A Doppler ultrasound is a special ultrasound that evaluates blood as it flows through a blood vessel. It provides information about the body's major arteries and veins in the abdomen, arms, legs and neck. Doppler images can help diagnose blockages, such as blood clots, narrowing of the vessels or tumors and congenital malformations. Echocardiography is another special ultrasound that evaluates the structure and function of the heart. It provides your physician with detailed measurements of the efficiency of your heart's ability to adequately pump blood throughout your body. The preparation will be determined by the type of ultrasound you are having. Some scans require that you drink several glasses of water prior to the exam so that your bladder is full; while others require that you not eat or drink for up to 12 hours prior to the exam. Your physician will instruct you on the prep for your particular test. Bone Density (DEXA) scans are done with machines that utilize low-intensity radiation to produce images of specific parts of the body. These images are then evaluated by the computer to measure the bone density of these areas of the body. This type of imaging is a great screening exam for the detection of osteoporosis and is a low-cost procedure to our patients. Heart Catheterization is an invasive procedure used to diagnose patients with suspected coronary artery disease. In a sterile, surgical setting, a long, thin tube is carefully placed, under x-ray video (fluoroscopy) guidance, into the arteries of the heart. A small amount of contrast (dye) is injected into the artery while rapid imaging of the heart vessel occurs. Upon completion of the heart catheterization procedure, a cardiologist will review all of the still images and the video images of the heart. This technology is the "gold standard" for the detection of narrowed coronary arteries which, if untreated, will continue to restrict blood flow to the heart and could result in a heart attack.